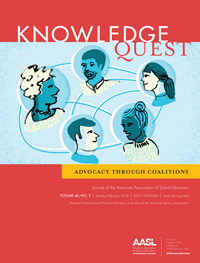 The focus of this issue of Knowledge Quest is Advocacy through Coalitions. School librarians must advocate for school libraries everywhere. Often the most effective advocacy method is joining groups or larger organizations that have the power to influence legislation. By banding together with others, we can affect change at a larger scale outside of our building-level libraries and campuses. Dorcas Hand saw librarians in Houston ISD being cut out of their schools and created a coalition of school library advocates to fight those cuts. Shannon Miller and Mark Ray share their thoughts on advocacy and how they are leading the charge for the Future Ready Libraries initiative. Jane Lofton explains how the California School Library Association worked with CUE (Computer-Using Educators), the West Coast affiliate of ISTE, to streamline their advocacy efforts. Allan Davenport and Dr. Kristen Mattson discuss how they used collaborative leadership in their district to empower their school librarians as instructional leaders to create a catalyst for change. Allison Cline, Sylvia Knight Norton, Marci Merola, Jane Lofton, Sue Heraper, Katie Williams, Teresa Lai, and the AASL Vision for Implementing ESSA Task Force discuss AASL’s ESSA State Workshops, CSLA’s advocacy efforts that came about due to the workshops, and the ESSA resources developed for school librarians. Also included in this issue is a very timely article from Joette Stefl-Mabry about formative assessment and an article from Deborah Rinio that explores how building trust with students and faculty can support collaboration. Finally we welcome our newest AASL members! As we welcome these newest into our fold, we remember how thankful we are that we have an organization like ALA and AASL to belong to ad they help us join together for the betterment of our profession. I hope you enjoy the articles in the Jan/Feb issue of Knowledge Quest. In working together through many different methods of coalition advocacy, the future is very bright for school libraries! 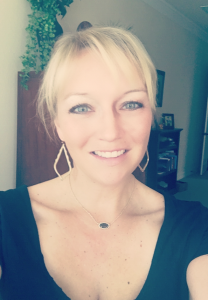 Nancy Jo Lambert is school librarian at Reedy High School in Frisco, Texas. An AASL member, she serves on the AASL Social Media Editorial Board and AASL Publication Advisory Group. Nancy Jo is the chair-elect of the Texas Association of School Librarians and is also active in ALA, the Texas Library Association, and the Texas Computer Education Association. She serves on the advisory board for the Mackin Transform Your School Library Movement. Among her recent publications is “Creating Genuine Readers with Flexible Scheduling,” published in the March/April 2017 issue of Knowledge Quest. Thank you, Nancy Jo, and the authors published in this issue for your outstanding articles. Yes! to building partnerships and coalitions with like-minded educators and literacy-focused initiatives as a pathway for school librarian leadership. There truly is no other way to ensure that our work in transforming teaching and learning will succeed in the short-term and be sustained in the long-run unless we work effectively and strategically with others. As Nancy writes, “Only by banding together and working toward specific goals can we have the kind of impact that affects real change” (7).